Sherbet, is sorbet’s creamier cousin — it’s cold, creamy and SO easy to make at home! All you need is frozen fruit, a can of sweetened condensed milk and a food processor or blender. No machine, no churning, all creamy fruity deliciousness. This recipe was originally shared by Cheryl from Tidy Mom for my Funner in the Summer Series. I’ve been on a peach kick lately, just can’t get enough of that sweet juicy fruit. The great thing about making sherbet is that you need frozen fruit, so you can make it any time of year. 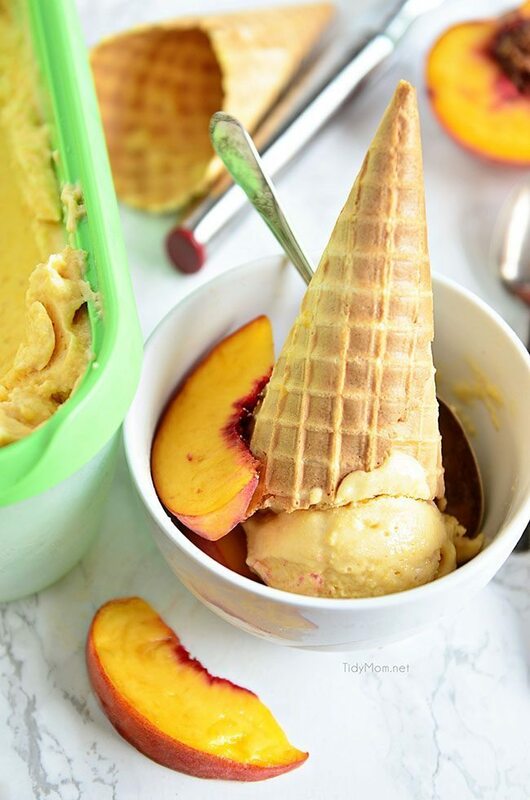 Right now peaches are in season, so if you have fresh, just slice them up and freeze and you can have peach sherbet in the middle of winter!! No fresh fruit to freeze? no problem, a bag of frozen fruit from the grocery store works just as well. Either way, you can turn plain old good-for-you fruit into a creamy frozen treat any time of the year. Not everyone has the space for an ice cream maker, and sometimes you just don’t want to deal with the mess of making ice cream at home. That’s why we make so much sherbet, it’s quick, simple and just 2 handy ingredients you can keep on hand to make any time the mood strikes you ;) – know what I’m sayin’? The trick to this no-churn sherbet is a combination of frozen fruit and sweetened condensed milk. Now that you know the little secret , you too can look forward to year long sherbet treats any time you feel like it. 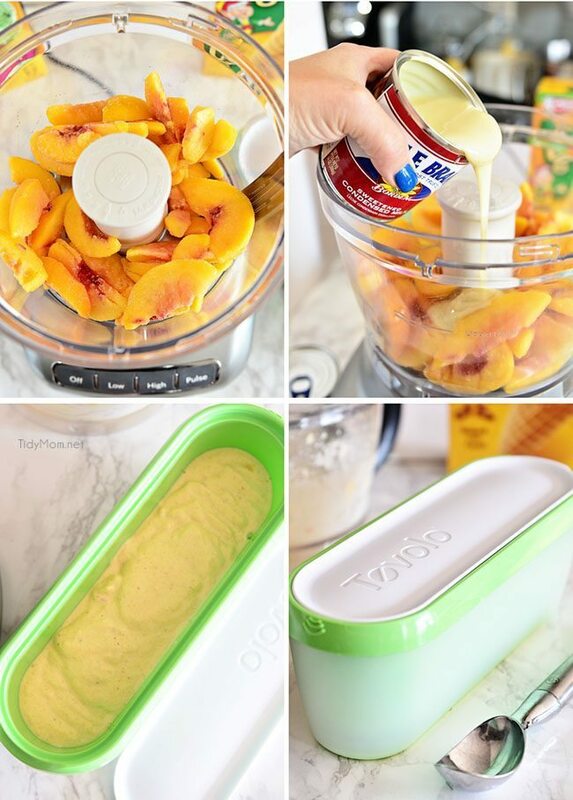 You don’t have to stop at peach…. try blueberry, strawberry, pineapple, even mixed berries! This stuff is so good — like, magically good and the flavor possibilities are endless. 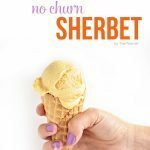 2 Ingredient No Churn Sherbet is cold, creamy and SO easy to make at home! Add fruit and milk to food processor or blender and combine until creamy. Serve immediately as soft-serve or freeze for an ice cream like consistency. Freeze for at least 3-4 hours to harden. Scoop onto a cone or into a bowl and enjoy!! 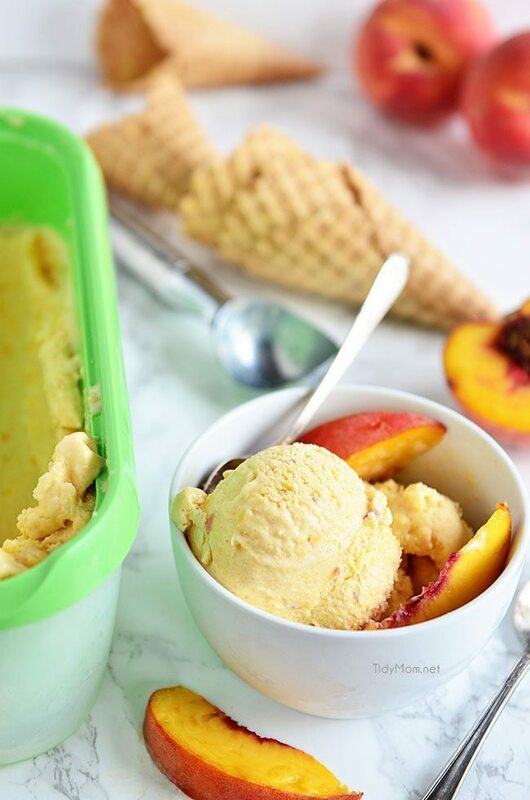 I love my Tovolo Ice Cream Tub, no freezer burn – yay!! 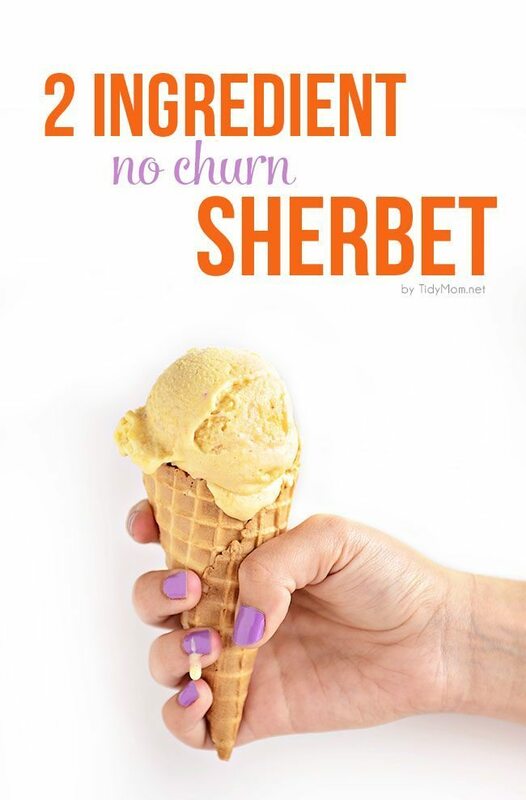 No-churn Sherbet is a wonderful fruity dessert, it’s not overly sweet and the fruit flavor is front and center. I can’t image how incredible this would be on top of a cobbler!! Do You Need a Side Hustle? What about orange sherbet? Could you use frozen orange juice concentrate instead of frozen fruit? Again, thanks so much for having me guest post Mique! !